Clementine is a multiplatform music player focusing on a fast and easy-to-use interface for searching and playing your music. Search and play your local music library. Listen to internet radio from Last.fm, SomaFM and Magnatune. Tabbed playlists, import and export M3U, XSPF, PLS and ASX. Edit tags on MP3 and OGG files, organise your music. Download missing album cover art from Last.fm. Native desktop notifications using libnotify. Supports MPRIS, or remote control using the command-line. Remote control using a Wii Remote, MPRIS or the command-line. Copy music to your iPod, iPhone, MTP or mass-storage USB player. 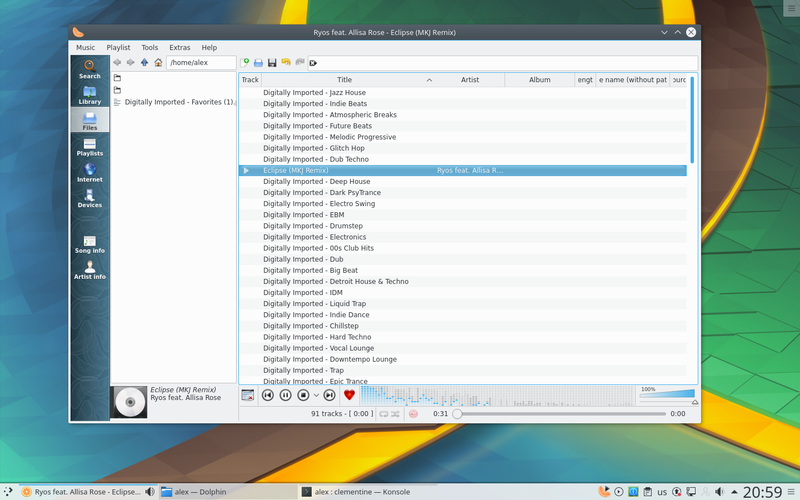 It is largely a port of Amarok 1.4, with some features rewritten to take advantage of Qt4.